I was inspired when listening to Margot Janse talk about food and life last week Saturday at the Eat Out Conference. She says she is Dutch by birth and South African by choice and this really resonates with me. Margot is all about integrity and honesty and cooks what is available here and now (her own words). 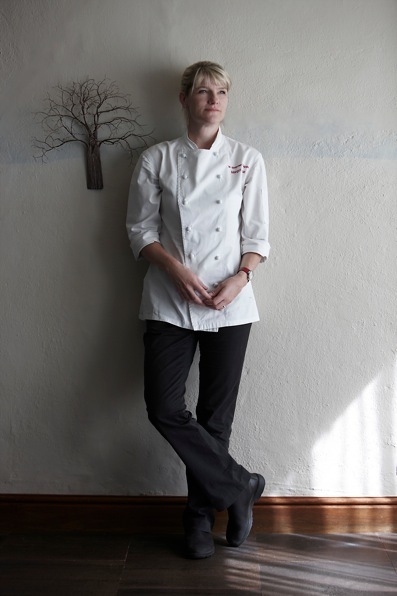 Margot is not only an exceptional chef, which has been emphasized by her winning the Eat Out Top Chef of the Year award for 2012, she is also involved in feeding the community and at present her restaurant feeds 850 school children every day! My brother, Herbert. He has been a mentor and real big brother ever since I can remember. It evolved from a serious interest into an obsession. I have always been curious about food and trying new things. It was in Johannesburg that I decided it had to be done. I wanted to work in a professional kitchen and learn all I could. I loved the experience of dining at El Bulli 6 years ago. I can’t describe it as a meal- it was a culinary experience. Fun, exciting, entertaining, amazing, one of a kind. That’s impossible to choose. I have many. Alex Atala. I find his beliefs and his food very inspiring. Nutmeg, overkill as a child! To take a year out and travel the world with my family. Highlighting our indigenous produce with integrity. Cooking with pure flavours and not overcomplicating dishes. thank you Juliana, and I hope you have a good week as well! I am impressed that children could be fed a healthy lunch.. instead of bagged stale sandwiches. We need more programs like that! Very nice interview, I like to read answers of people who inspire me. She sounds like a remarkable lady with true integrity. Thanks for sharing the interview. Margot is realy an amazing and inspiring person! Have you ever eaten at her restaurant? I had the privilidge a couple of years ago and it was one of my experiences that I will treasure forever! Enjoy your time in Jhb! What a fantastic person! I wonder what she mean when she talk about dishonesty in the kitchen. I think some people say they have done something when they haven’t – or that they have done something when they have! I always enjoy your interviews—keep ’em coming! =) Hope you had a great weekend, Tandy!! Safe travels Tandy! Thanks for another great interview. Wow, Tandy: you get some great contributors to your interviews! What a refreshing attitude from a woman who clearly walks the walk a well as talking the talk. I really enjoyed this interview – thank you to you both! I’m sitting with a beautiful baby on my lap at present 🙂 I would be very far from the renovations as well AD! Wow 850 kids a day – that is incredible! Margot sounds like a remarkable lady. I heard so much about Margot when we were in South Africa! I wish we could have had time to meet her 🙂 But this is great Tandy and I feel like we did here.